Not long ago, I spent a really fun Saturday learning how to make shaped pasta over at Pasta Puttana. Pasta Puttana is a local Chicago purveyor of homemade pastas available in a variety of flavors and shapes. The physical shop is located on an unassuming little block in Chicago's River West neighborhood, but I became familiar with the brand long ago at the Green City Market. Pasta Puttana is a mainstay at Chicago farmer's markets-- the perfect location to pick up some fresh pasta to serve with locally sourced vegetables. Being a fan of their products already, I was so excited for the opportunity to take a pasta making class with Jessica and her staff. 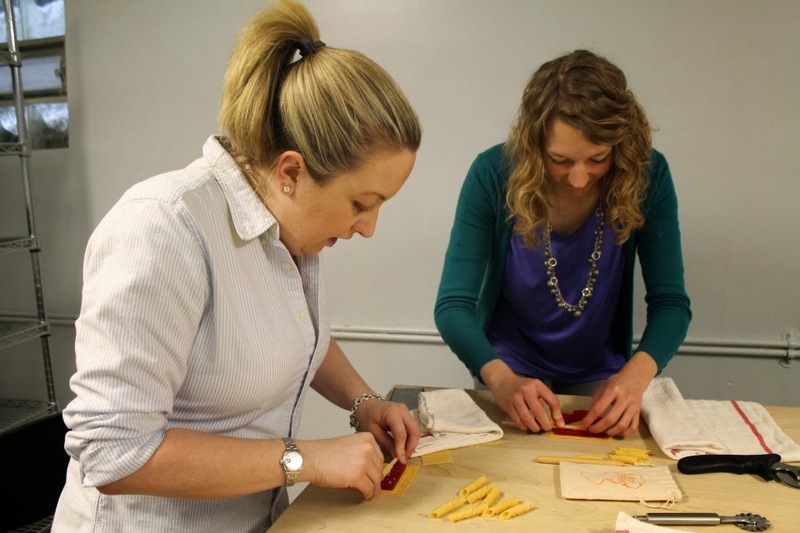 They have offered other themed classes in the past, but ours was all about learning different pasta shapes: where they came from, how to make them, and best practices for preparing them. Even as an unofficial pasta expert, I learned a ton during this class! I joined two of my fellow Windy City Blogger Collective members-- Debbie (pictured with me above) and Kit for the class, which made it even more fun. It was a small group of probably 10 students so it was informal and we had a lot of time to work and chat with the Pasta Puttana staff. We started off class learning how to make farfalle, Italian for butterflies. We used a beautiful vibrant green pasta dough made with spinach and chives to create our perfect little bowtie-shaped noodles. The trick here to achieving the proper shape was to make sure that the dough was cut into squares before pinching the center together. We also learned how to make three small pasta shapes (see top right in the photo above): orecchiette, cencioni, and cavatelli. These were particularly interesting because all three shapes could be made from the same swatch of dough. The orecchiette noodle, for instance, is simply a cavatelli turned inside out. We each received our bag of pasta tools to create our next two pasta shapes: corzetti and garganelli: It included a textured board for rolling out the pasta dough and creating beautiful imprinted patterns, and a dowel, which works as a miniature rolling pin. The corzetti were simply round pasta coins rolled out on the board for a lovely lace-like texture. It's not a pasta shape that you often see anymore, but Jessica tells us that years ago it was a popular way for Italian nobility to showcase their family crests. 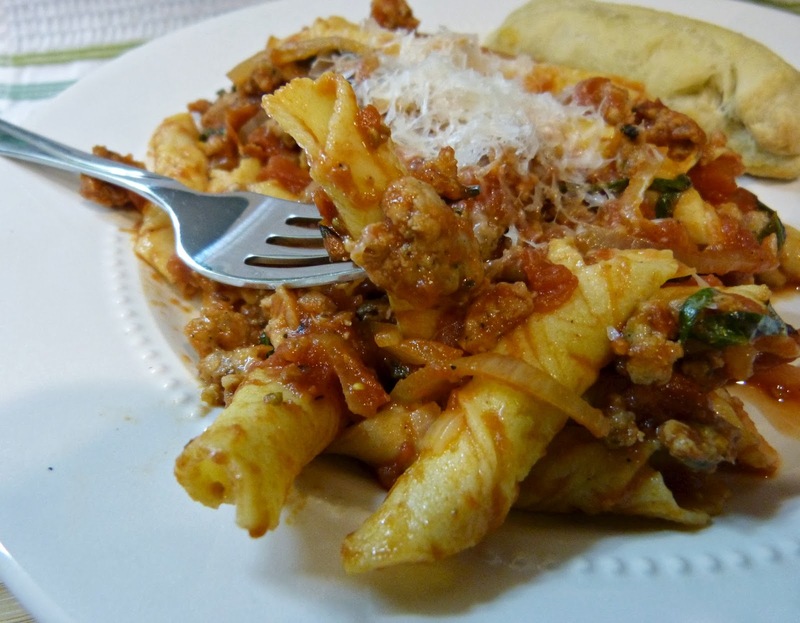 My favorite shape to make was the garganelli: A textured sheet of dough rolled up to create lovely tubular pasta. It's the pasta that I'm rolling out in that photo at the top of the post and will also be featured in tomorrow's recipe post too! If you live in Chicago, check out Pasta Puttana soon! Sadly, they are closing in March. Stay tuned though-- Jessica is moving out of Chicago, but you may likely see Pasta Puttana show up in another form or location. Fingers crossed!